Lee Won- seok debuted in 2013 with the vivacious romantic comedy How To Use Guys With Secret Tips. It became an unexpected hit among critics as well as the viewers. Nevertheless, it did not do well in the box office mainly because it was up against three biggest production of the 2013; The Berlin File by Ryoo Seoung- wan, New World by Park Hoon- jung and Miracle in Cell No 7 by Lee Hwan- kyung. In 2014 Won- seok released his second film entitled The Royal Tailor. Although the director drew on the good acting talent of the cast such as Han Suk- kyu (Green Fish, The President’s Last Bang), Park Shin- hye (Miracle in Cell No.7, One Perfect Day), Go Soo (The Front Line, Way Back Home), Yoo Yeon- seok; who debuted in Park Chan – wook’s Oldboy, and Ma Dong-seok; well known for his role in Kim Ki- duk’s film One on One; The Royal Tailor wasn’t as successful as most of film goers anticipated. Regardless of the 10 million dollar budget, the production managed to earn slightly over $5 million . The Royal Tailor revolves around Jo Dol- seok (Han Suk-kyu)- a tailor, who is a personal outfitter to the Kings of Joseon dynasty for three generations. Born a commoner, he slowly climbs up the career ladder and becomes the head of the royal attire of the Sanguiwon, who now patiently awaits to join the aristocracy of noblemen. Nevertheless, it is all threatened by unexpected appearance of a new and relatively unknown young tailor, Lee Gong- jin (Go Soo), whose unconventional taste in fashion amazes women of ill repute. The Queen (Park Shin- hye), to impress her husband, decides to repair an old king’s robe; however, due to the carelessness of ladies of the royal court, the outfit is partly destroyed. Without hesitation, she asks Dol- seok for help. Regrettably, the tailor refuses, stating that there is not enough time to repair the robe. The Queen comes to a decision to make use of Gong- jin’s talent to fix the garment. The young couturier impresses the King (Yoo Yeon- seok) and quickly becomes popular within the Royal household. When Gong- jin desings, he designs using his imagination and inspiration rather than the traditional patterns. He focuses his attention on colours, fabrics and emphasize the qualities of people who wear them. His passion for tailoring excites mainly the Queen. With that in mind, he decides to help her in becoming the most desirable woman in the country and winning the heart of the King, who, since the wedding, ignores his wife. Unfortunately, Dol- seok enviously follows Gong- jin’s progress and gradually starts to compete against him. 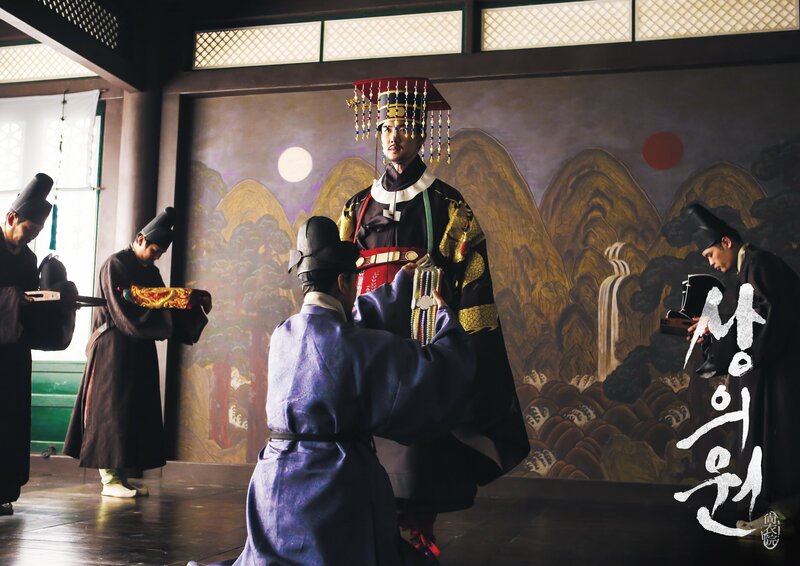 Everything drastically changes when the King brings a new concubine, Soui (Lee Yu- bi) to the palace. Soui, with the inspiration of becoming the new Queen, orders Dol- seok to design a stunning dress. Gong- jin does the same but for the Queen instead. Sadly, from this point onward, Gong- jin’s faith is sealed. Alas, Soui’s covetousness and Dol- seok’s jealousy merely results in a tragedy for both the Queen and Gong- jin. Sageuk films “tend to be long, very detailed and likely covering wars, concentrating on military leaders, kings or political intrigues.” When is comes to The Royal Tailor there is no comprehensive story about the mentioned subjects. The story doesn’t concentrate on one leading character, as the title of the production suggests. Parallel to Dol- seok’s narrative, there is the one of Gong- jin, the Queen, the King as well as Soui’s. You will definitely notice that the director didn’t put too much efford into developing the characters properly. Who exactly was the royal tailor? What’s Gon- jin’s background story? How about the relationship between the young tailor and the Queen? Even the complex bond between Gon- jin and Dol- Seok wasn’t intensely looked into by the filmmaker. The entire film story seems to be slightly superficial including badly balanced humour. The Royal Tailor definitely deserves an applause for its down to earth cinematography (Kim Ji- yong) and Jo Sang- gyeong’s stunning costumes; which took over 6 months to make and cost over $ 1 million. Flawless editing by Nam Na- yeong (I Saw the Devil, The Good, the Bad, the Weird) and music by Mowg also added a great note to the film. Go Soo’s portrayal of Gon- jin was good but not impressive. Well known for his spectacular performance in Jang Hoon’s Front Line, I found his acting too melodramatic. Han Seok- kyu played with the same intensity as usual. The royal couple Park Shin- hye and Yoo Yeon- seok arouse mixed feelings. Shin- hye’s pretty smile and a delicate body language- suited for the Queen herself, was delightful to see. However, the limited dialogue in the film didn’t allow her to show her full potential as an actress. I was slightly disappointed when it came to Yeon- seok’s acting. I wish he was more engaged with the character he played. I felt like he was daydreaming when portraying the king. Lack of adequate facial expressions made me think that he forgot how to act. Having said that, I think the audience ignored The Royal Tailor mainly because it was an unconventional movie, in which you could even see the rabbits on the moon. Do not ask me why; this part of the film seriously weird. 2014 has seen terribly overrated historical dramas such as The King’s Wrath, The Pirates and Roaring Currents and a good one; Kundo: Age of the Rampant. Which category would I place The Royal Tailor in? Probably in the overrated one.